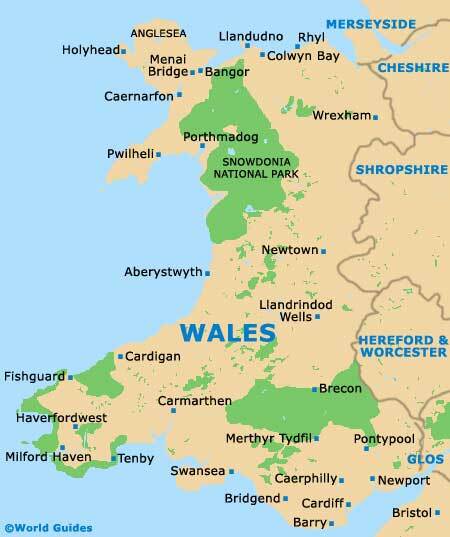 Wales lies to the west of England and is bordered by the Irish Sea to the north and west and the Bristol Channel to the south. Much of the Welsh breathtaking countryside consists of hills and mountains that includes the Cambrian Mountains, the Brecon Beacons and Snowdonia. The highest mountain is Wales is Mount Snowdon. Anglesey is an island off the north-west coast of Wales, separated by the Menai Strait but linked by road and railway. Tourists to Wales will enjoy the wealth of historic places to visit in Wales such as Cardiff Castle, Caerphilly Castle, Tintern Abbey, Caldicot Castle, Tretower Court and Castle, Conwy Castle and Caernarvon Castle, as Wales has a long and rich heritage. Wales has a wealth of accommodation to suit all travellers including budget lodging, travel lodges, bed and breakfast and luxury hotels. There is so much to see and do in Wales including blue flag beaches, national parks, sporting venues, walking trails, mountaineering, museums, landmarks, monuments, festivals, carnivals and quality shopping. Cardiff, is Europe's youngest capital city and Cardiff has been the capital city of Wales for around 50 years. Home to an enormous amount of urban regeneration, Cardiff has recently become one of the most fashionable cities in the UK. The third-biggest city in Wales, Newport is to be found in the Gwent area and is well-known for its industry and commerce. Much of Newport city centre has a strong Victorian character and is home to plenty of elegant structures. The second-largest city in Wales, Swansea has successfully improved its appearance in recent years and its impressive National Waterfront Museum has played an integral part in revitalising the now rather fashionable Maritime Quarter.